Over the past 5 months, graduate artists from around the world have entered the coveted Signature Art Prize to compete for the opportunity of representation by DegreeArt.com, a winners exhibition at Cass Art’s Flagship Islington Store, artwork tagging by the world’s first DNA tagged and Certificated artwork aggregation service, Tagsmart as well as prizes from the competition sponsors: Bankside Hotel, Barnard and Westwood, Cass Art and CAPITA. The four category winners will be announced at the VIP (invite only) opening gala exhibition on Thursday 31st January 6-9pm, held in the newly opened, design-led Bankside Hotel, on London’s Southbank, showcasing all forty-one finalists. From there, the exhibition will move into London City Island’s, Trinity Art Gallery from the 1st February - 1st March 2019. This year’s winners finalists have been selected by our esteemed judging panel consisting of artist Lee Madgwick; London Area Director of the Arts Council England, Joyce Wilson; Co-Founders of Powerstip Studios, Dayna Lee and Ted Berner; Co-Founder and Director of the Institute of Making, Zoe Laughlin; Associate Director of Early European Sculpture & Works of Art at Christie’s, Milo Dickinson and Business Development Director at Jones and Jones, Kate Jones. 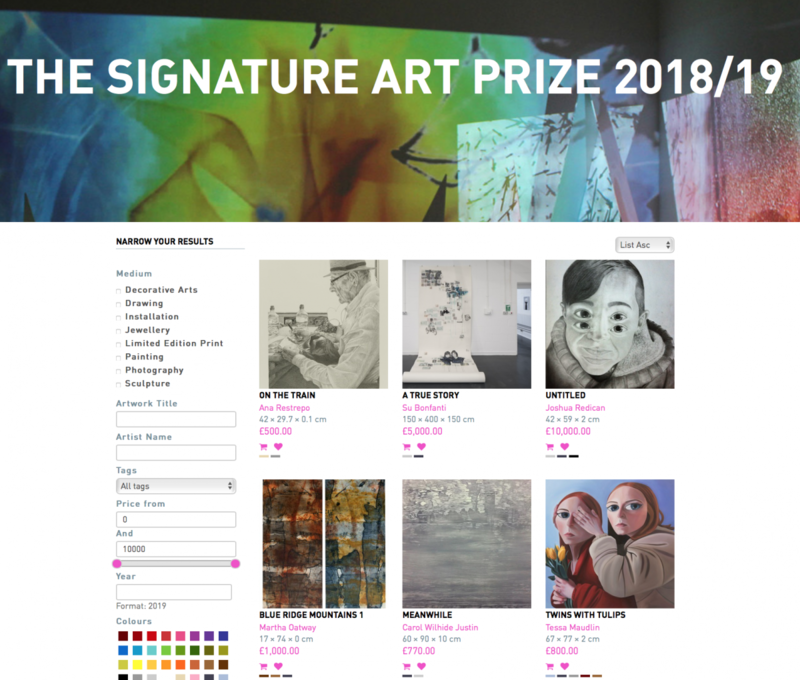 Founded in 2007, the Signature Art Prize is the only award of its kind that aims to promote the work of artists in the very early stages of their careers. Drawing attention to the unique perspective of students and recent graduates, the prize champions their signature themes and aims to bring their work into the spotlight. The Signature Art Prize was conceived by DegreeArt.com directors Isobel Beauchamp and Elinor Olisa. They define an artist's 'signature style' as being "that which makes an artist unique; a combination of process and method, contributed to by the artist's own personality which results in a piece that is unique and specific to them." Those who visit university degree shows will be aware of the remarkable talent and high standards on show, and the Signature Art Prize aims to capture this energy and assist young artists in exhibiting and promoting their work in an often challenging art world. On February 4th, The Signature Art Prize Exhibition 2018/19 will move to our gallery space at Unit 22, Hope Street, London City Island, London E14 0LG. Opening Times: Sun-Mon by appointment only, Tues-Fri from 12–6pm and Sat from 10am-6pm.